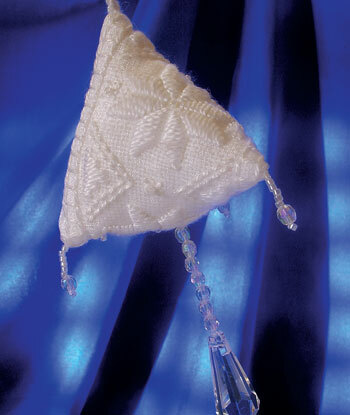 The Organza Hardanger Ornament features a band of traditional-style Hardanger which is constructed into a tetrahedron shape. It is suitable for intermediate to advanced stitchers, as although the Hardanger stitching is simple, it has an added degree of challenge because the base fabric has an organza overlay. This gives the ornament an all-over added sparkle, making it an excellent addition to any Christmas tree. Of course, it doesn't just have to be used as a Christmas decoration. It is stunning in its own right, and can be used as an ornament at any time of the year!